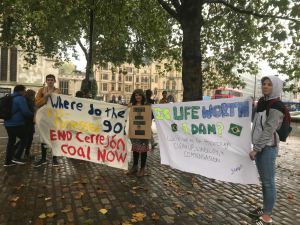 The issues raised around the BHP AGM by Angelica Ortiz and Luisa Rodriguez from Colombia were well covered by BBC Radio 4’s The World Tonight, RTTV’s Going Underground, The Ecologist, Counterpunch (reposted from The Ecologist) and Independent Catholic News. Latin America Bureau interviewed Thiago Alves da Silva and Rodrigo Peret from Brazil about BHP’s role in 2015’s Samarco disaster. Independent Catholic News also reported on our preparations for the AGM and Medact reported on the demonstration outside. Threepenny Festival, which put on a dramatic presentation as part of the demonstration, have also produced a related short video called Stand Up For La Guajira. Radio coverage at http://www.abc.net.au/radio/programs/pm/business-pm/9159444 (from 2 minutes onwards) and http://www.abc.net.au/radionational/programs/breakfast/the-big-australian-under-pressure-to-quit-minerals-council/9161276.